Soft Goat Skin 0.7-0.9mm thickness Same is also available in Sheep Skin & Cow Leather in combination with Nomex® in any required color Combination. 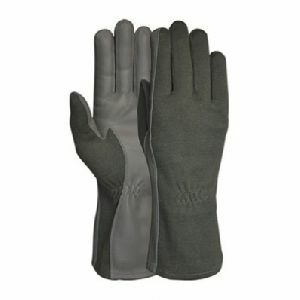 Nomex Flight Glove is made in strict compliance with MIL- SPECS, with 100% aramid fiber fabric weighting seven ounces. Customize Logo and Custom Designs are being offered for Nomex Flight Gloves.